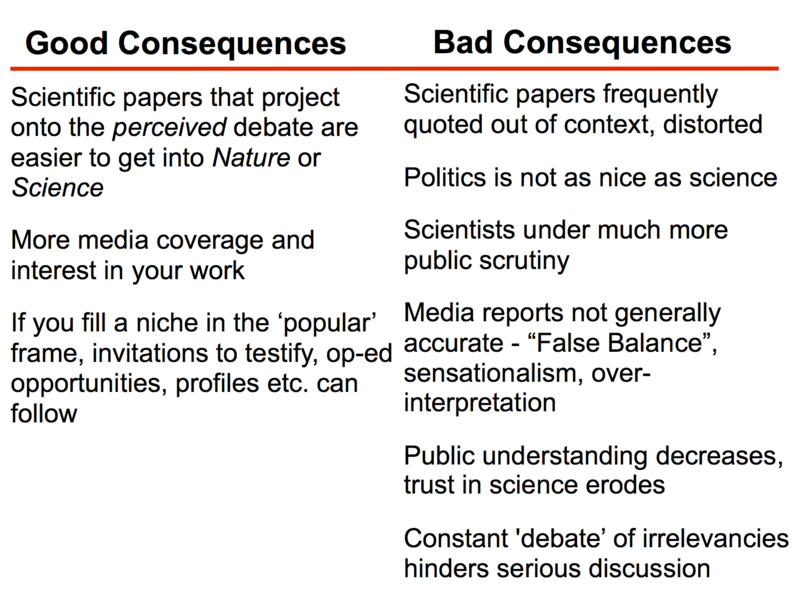 I have mostly been sitting back and watching the John Bates story go through the predictable news-cycle of almost all supposed ‘scandalous’ science stories. The patterns are very familiar – an initial claim of imperfection spiced up with insinuations of misconduct, coordination with a breathless hyping of the initial claim with ridiculous supposed implications, some sensible responses refuting the initial specific claims and demolishing the wilder extrapolations. Unable to defend the nonsense clarifications are made that the initial claim wasn’t about misconduct but merely about ‘process’ (for who can argue against better processes?). Meanwhile the misconduct and data falsification claims escape into the wild, get more exaggerated and lose all connection to any actual substance. For sure, the technical rebuttals to the specific claims compete with balance of evidence arguments and a little bit of playful trolling for the attention of anyone who actually cares about the details. None of which, unfortunately, despite being far more accurate, have the narrative power of the original meme. The next stages are easy to predict as well – the issues of ‘process’ will be lost in the noise, the fake overreaction will dominate the wider conversation and become an alternative fact to be regurgitated in twitter threads and blog comments for years, the originators of the issue may or may not walk back the many mis-statements they and others made but will lose credibility in any case, mainstream scientists will just see it as hyper-partisan noise and ignore it, no papers will be redacted, no science will change, and the actual point (one presumes) of the ‘process’ complaint (to encourage better archiving practices) gets set back because it’s associated with such obvious nonsense. This has played out many, many times before: The Yamal story had a very similar dynamic, and before that the ‘1934‘ story, etc. etc. Assuming for the sake of politeness that sound and fury signifying nothing is not the main goal for at least some participants, the question arises: since this is so predictable why do people still keep making the same mistakes? [Pro-tip: talking about massive international multi-agency conspiracies makes you sound like a crazy person, so get past that by only talking about the whistleblowers!]. Unfortunately, Bates and Curry, perhaps deciding that judgement calls about where on a complex maturity matrix (right) (Bates et al, 2014) any specific dataset should be placed, was not likely to generate much attention, decided to over-egg their pudding: Bates added obviously wrong claims to his litany (like the claim that ASCII data on an ftp site was neither an archive nor ‘machine readable’), and let his imagination run beyond what he could actually show (‘thumbs on the scale’ for instance). David Rose, certain that he had a juicy data tampering story didn’t bother to check his graph when it seemed to show a big difference between analyses. Note that the graph did not actually use the data from the Karl et al (2015) paper at all. Thus a perhaps interesting claim about process, got turned instantly into a claim about misconduct, and another hammer to be used to undermine independently replicated conclusions (Hausfather et al, 2016). In Bates’ later interviews, he tried to close Pandora’s box – for instance saying that “The issue here is not an issue of tampering with data, but rather really of timing of a release of a paper that had not properly disclosed everything it was”. Well, whoop-dee-doo. Weirdly he also claimed that he is wary of his critique becoming a talking point for those skeptical of human-caused climate change and that “I knew people would misuse this”. Which kinda makes my point but also raises some obvious questions! The key element in politicized discussions of science is the obvious desire of most people to have the narrative confirm what they desperately want to be true. Thus however little the story projected onto the faux debate, that is where the story was going to go. The initial exaggerations and false claims just made this more likely. 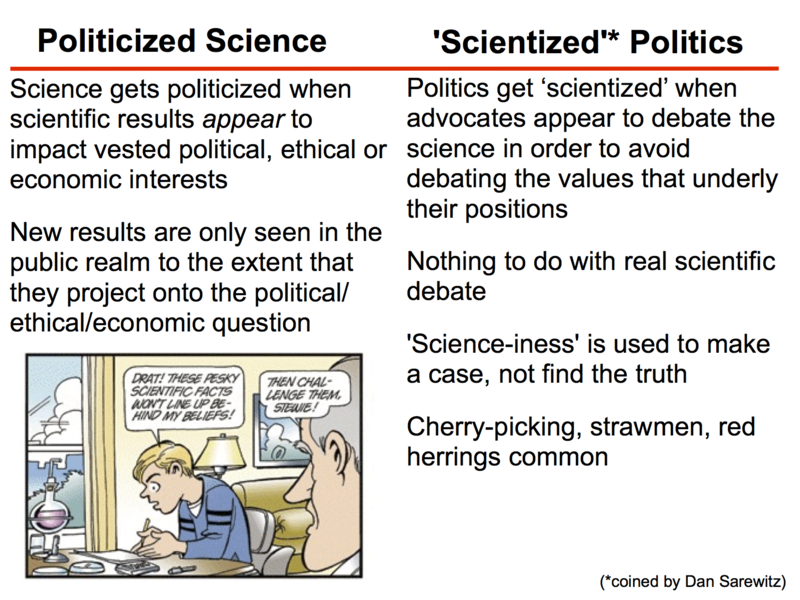 In contrast to the argument made in a recent New York Times op-ed, science is not politicized because scientists are citizens and have opinions (they are and they do), but because certain narratives suit political movements better than the truth. Scientists can fight against this by being scrupulous in not giving opportunities for people to take their words or work out of context and project it onto the faux debate. One can be clear from the beginning about what can’t be concluded, as well as what can be. Specific complaints about specific issues need to be clearly distinguished from general complaints about everything. I find that people who do this don’t get caught up so much in these faux scandals, while for people (like Bates) who don’t see it as their responsibility to properly contextualise their statements, it happens over and again. When people who know better go ahead anyway, you end up with this kind of mess with all the bad consequences outlined in the above slide, regardless of the point that someone thought they were making. But in this case the actual substance is a total NOAA-thing burger. As long as you are content with being a victim, you will continue to be a victim. Act now to protect what slivers of your nation that you can, or sit back and be complicit with the total destruction of what you once valued. So we go merrily round and round in circles again. By the time science can prove with 100% certainty that this is caused by that the situation has bolted and never again be brought to equilibrium. In the current state it is a no win situation. Governments have got to plan using risk analysis. So if a prominent team of climate scientists or the IPCC come to a figure if say a 80% chance of irreversible climate change based on as established quantity of allowable emissions governments have got to take notice and act. Not look around for alternative facts to bolster their agendas. I unfortunately cannot see a way out of this pernicious dilemma. The fact that the majority of Americans believe trump rather than the truth really frightens me. The only way the world can survive sustainably is through global cooperation and unity. We seem to further from this elusive dream than ever before. I sense that we are heading towards war. Hopefully after the dust has settled those of us remaining can unite to form a future that is carbon negative and perpetually enjuring. It is important to realize that the problem here is much more prevalent than the climate issues. The right-wing has found out that, all over, lying works as a tactic and strategy. It is a new political culture. Attacking the disinformation about climate can have little effect, without the broader issue being dealt with. MF 48: Only publish what is reproducible, make all supporting data freely available. Accept you may be wrong. BPL: Since scientists pretty much already do that, you’re not dreaming, you’re awake. Congratulations. Actually, whatever they do, scientists must not keep their mouth shut, firmly or otherwise. And how, pray, do they know what is reproducible until they publish and see if others can reproduce the result? Science advances best when it is allowed to be wrong occasionally. The problem is that the denialati, backed by their fossil-fuel sugar daddies, have so distorted public perception of climate science that the public mistakenly think that the basics of climate change are cutting if not bleeding edge science. This is simply false. Questioning whether greenhouse gasses cause a planet to warm, or that CO2 is an important factor in understanding Earth’s climate is akin to questioning conservation of mass or energy. This is not an exaggeration. The realization of the importance of greenhouse gasses was roughly contemporaneous with the realization that energy and mass are conserved. The recognition of the importance of CO2 predates the theory of Evolution. The most basic understanding of climate science by itself is sufficient to conclude that we are the ones warming the planet and that this will have significant negative consequences for an advanced, global civilization. If you question that basic understanding, and you do not have some profound reason for doing so, then you are simply ignorant. At the same time, there is a real cutting edge–even a bleeding edge–to climate science. This is where we learn how much trouble we are in. These bleeding edge papers may be wrong. Indeed, they must be allowed to be wrong occasionally. That they may be wrong in no way undermines the basics, however. A wonderful example is “the pause”. This putative occurrence was interesting not because it would undermine our basic understanding, but rather because it could provide insight into how different components in the climate system (atmosphere, oceans…) share energy. Whether there was in fact a pause is only interesting in terms of the insight it might yield into energy transport, not whether we are threatening our won civilization. That is established by the basics. Mr. Flynn apparently has spent too much time in a world of half truths and outright lies, a classic House of Mirrors where spreading disinformation is the usual MOA. Science is about finding the truth, a quest with many twists and turns, but where lying and falsifying data are the worst “sins”. Perhaps Mr. Flynn needs to take his own advice to heart: Accept (that) you may be wrong. Incorrect. Republicans have decided that they will accept any lie that supports their desired world view, no matter how insane that lie is, or how insane the person telling that lie is. And as is now self evident, your president is insane. This is why science is not effective. Reason only influences the reasonable. It has no effect on the willfully ignorant. That is not a fact! Less than 60% of eligible voters voted in the last election and Trump lost the popular vote and was elected by roughly 26% of eligible voters. Not exactly what one might call a mandate. Furthermore, out of that 26% who did vote for him, many did so quite reluctantly. Even now many of those are already openly expressing doubts about his competence. “Pretty much . . .”? Why not all the time? Why would a scientist try to hide anything? Maybe someone might try to find fault? Really? Any real scientist repeats his experiment. If the result doesn’t bear out the theory, something’s wrong somewhere. As an example, nobody has managed to make a thermometer hotter using CO2. No one. Maybe someone should try. How hard can it be? I guarantee you haven’t done it, and that you don’t know anyone who has. As far as I know, the Earth’s surface has cooled over the last four and a half billion years, CO2 notwithstanding. Have you considered that thermometers recording higher temperatures may be simply indicating that they are hotter? Can you think of any reasons for this? What might I be wrong about? The fact that nobody has ever managed to demonstrate that a thermometer can be made hotter by using CO2? A fairly simple task, surely. I’m even sure that doubling the amount of CO2 in a sample of air changes the temperature not at all. If I’m wrong, I’m sure you will point me to a reproducible physical experiment demonstrating this. I just expect a repeatable experiment. (Computer models are not experiments.) Maybe you consider repeatable experiments irrelevant. I don’t. 49 Steven T. Corneliussen says:	… –is to exacerbate polarization. That may be true. Well it is true. I think you’re being unnecessarily hyperbolic by declaring 3 weeks an “era” whatever the signifier is. What’s your next step? Calling everyone who voted for or supports ‘one’ of the various policies of Donald Trump a “deplorable”? But it’s no justification not to seek to understand what’s actually going on. Seek to understand? It appeared to me reading your words that you already knew with great certainty what was going on. It’s the dreaded ‘Trump Era’ – disinformation via the media, via social media, via twitter, via newspapers, via paid media ‘talk heads’ opinionators, unnamed sources, fake news, cherry picked news, slander and libel every second article, insults put downs and verbal abuse and lies (cover-ups and distractions) 24/7/365 by Politicians from the President of the USA down and the media hacks and …. so tell me, what’s changed since the 20th January? Amercian politics was a joke before the 20th January and it still is. Action on AGW/CC and taking historical responsibility for it’s massive 24% contribution to the Global temperature rise and other harms done was no different now than it was on the 19th January. This new administration is now winding even that weak action back. SO what? Either way it was stuffed and doing nothing of real value. But if it has taken “a Trump” for you and others in the US to finally get off your butts and be enraged about the lack of USA action on AGW/CC and the BS in the political and legal system there, then three cheers for Trump for motivating y’all. You may also find this article interesting? Abel discovered that many other motives were involved, among them a sense of the decline of Germany, a desire to rediscover past greatness, a fear of social disorder and the longing for a strong leader. We would argue that the same is true of those who supported Trump. ”Bates told ScienceInsider that he is wary of his critique becoming a talking point for those skeptical of human-caused climate change. But it was important for this conversation about data integrity to happen, he says. “That’s where I came down after a lot of soul searching. I knew people would misuse this. But you can’t control other people,” he says.” (My bold). It appears Bates is not man enough to put the record straight. Even his denialism remains in the closet. I also note the absence of Rose’s chum Judy Curry. She cannot be pleased with either part of this double serving of lies. And reading Rose’s latest serving of lies, I note he exhibits his own denialism in his takeaway paragraph. So this chap can demonstrably live with ”uncertainty” because he says it’s about ”when it is likely … to become truly dangerous.”(My bold) But because he doesn’t like the answer science is providing him, Rose manages to blank the reality of the science from his mind and deny the AGW problem. Excellent. I am really impressed how you completely ignored the Congressional results and the Electoral college realities that no US President has ever being elected by Popular Vote. I am also very impressed how you probably do not know that the US is 2 states away from being able to change the US Constitution at will … should the Republicans and the President so desire such a change. Meanwhile As for the rest of Americans, I have an unscientific hunch, that they trust him about as far as they can throw him. Yes let’s make it all about Trump, clearly the child of the devil, while ignoring the fact that the US Congress (all of them inside that snake pit) are lucky to get “approval ratings” above 10% at any time the last 3 decades! And yet, at the last election every Congressional Rep and Senator standing for re-election were voted back into Congress for 2 or 6 years. There is much to be frightened about by the actions (absent of intelligence) of ALL American Voters. For they are far more frightening, ignorant and deluded than Donald Trump could ever possibly be. imo, your mileage may vary. Still, credible scientific and academic research tends to back my position with an overwhelming consensus. So you are an atmospheric physicist then, Mr. Wolfe? Incorrect. Perhaps you’re unfamiliar (willingly, I’ll assume) with history. You can start with Woodrow Wilson and the Spanish Flu and read through to Wild Bill (and the Mrs. for more recent examples) of the Democratic Party’s acceptance of any lie. Science should be bi-partisan; sadly, it’s been a long time (if ever) that it has been. My hunch is (also unscientific) they figured they could throw him further than they could throw Hillary. But again, just a (unscientific) hunch . . .
From (about) 350 million people the Don and Hillary (sorry, and the Libertarians that I’ve forgotten by name) were the choices . . . sad really, when you think about it. Apparently Ray hasn’t been paying attention. The ‘Pause’ never happened. Full stop. Another thing that ain’t gonna happen is getting a refund on all the peer-reviewed papers that were published to explain it. Maybe I’m finally beginning to understand at least some of what seems obtuse, incoherent, and perverse coming from Thomas, most recently in 60. I gather that he so deeply detests American inaction on climate that he also disdains my attempt (now old news) to point out that the cynical Rose disinformation stunt’s actual purpose, choreographed with politicians, is bogus pretext for, as James Delingpole’s Breitbart headline puts it, the new president’s draining of the “climate swamp.” Apparently Thomas thinks that fecklessness subverted and sabotaged by a hostile and empowered new president is still fecklessness, so who cares? The answer, of course, is that I care, and so do all those who’d like to see American climate scientists continue their research unmolested, whatever is to be said about US fecklessness in creating climate policy and putting it into effect. My sense is that in the time of this hostile new president–whether or not Thomas remains enraged by my calling that time by the prosaic, ordinary name “era”–plenty of bad things can happen. This exchange will long since have become tedious to onlookers. I apologize. With all due respect, Thomas, old chap, did my comment perchance cause you to get your knickers all in a bunch, eh? Dear, dear! No matter. In the interest of soothing your psyche, I will gladly proclaim, that 26% out of the total of all possible votes is as HUUUGE mandate, it doesn’t make it true, but that’s not really the point, is it? Please do accept, my deepest heartfelt thanks for the civics lesson on how easy it might be to amend the US Constitution. Your most impressive depth of constitutional scholarship and knowledge, thus imparted, has helped fill a profound void in my vast ignorance of these matters! I’m sure you are quite right, just about any nincompoop with a third grade education and wearing an orange bird’s nest on his head, should be able to easily decree any constitutional modification that suits his or her fancy. The wrath of the Judiciary and legislative branches, notwithstanding and despite it being glaringly obvious, that said nincompoop, has never bothered to actually read that august document himself. Mike Flynn, your questions indicate you have a profound misunderstanding of the greenhouse effect as well as a lack of knowledge on the temperature and CO2 history of the earth. You might look up the faint young sun paradox and what came after that for the latter. If that’s too tough, the Wikipedia entry on the greenhouse effect isn’t all that bad either. MF 69: nobody has managed to make a thermometer hotter using CO2. BPL: Where did you get that idea? Of course they have, it’s a pretty standard experiment. You fill one box with air. You fill one with CO2. You shine a lamp on both and record the temperature inside. Experiments of this kind have been done since 1858. Th 60: three cheers for Trump for motivating y’all. BPL: We were already motivated. Stuff your nationalist arrogance. Th 63: There is much to be frightened about by the actions (absent of intelligence) of ALL American Voters. BPL: Every last one of ’em, huh? Not a good, decent individual in the bunch. Unlike you. You are the only one who sees it all clearly, who knows, instinctively, what is Right. Thank God you’re here to enlighten benighted fools like us. Not least because “she” informed David Rose’s Managing Editor what was about to happen the day before the Mail’s apology for a “correction” hit the streets of the once Great Britain! I think I’ll head to the newsagents first thing tomorrow morning, to make sure I grab a copy of the MoS before it sells out. What “Shock News” might be next I wonder? What is a mandate in the realm of the politically damaged and the demented? Trump & Co.: The weak of will, the strong of arm, the clown? So can war (and miscellaneous other crises) be staved off beyond 2018 and AGW, among other things, put back on the table for some reality-based consideration? I’m asking. Mike Flynn, 59. As an example, nobody has managed to make a thermometer hotter using CO2. No one. Maybe someone should try. How hard can it be? I guarantee you haven’t done it, and that you don’t know anyone who has. That would be no one other than an extensive list of scientists starting in the 1800s, when scientists measured heat transfer through tubes filled with a range of gases – to today, when they do it extensively by measuring the infrared spectra. Though I have a sinking feeling that you might be thinking of an experiment where you put a thermometer in a box filled with percentage X of CO2, and then double the CO” and measure the temperature again. In which case you are right, but that’s got nothing whatsoever to do with CO2’s effect on climate. And then your Feynman quote – “And now you find a man saying that it is an irrelevant demand to expect a repeatable experiment. This is science? In context, talking about ESP and spoon bending he was right. But lot’s of science is about observation, because we don’t just do science on things that fit into a laboratory. Science can be observation, hypothesis, further observation to support/deny the hypothesis. Your reductive test tube view of science would mean that we know nothing scientific about a myriad things – from the basics of cosmology (I tried to set of a second big bang but the the ethics committee wouldn’t let me…) to astronomy, the majority of earth sciences, evolutionary biology etc. Richard Feynman might well have made a distinction between science and observation, he was after all a physicist and they like experiments. But there is a fallacy of composition in the statement ‘All science requires repeatable experiment’ ‘You can’t experiment on the climate’ therefore ‘Science has nothing to say about climate’. Mike Flynn, and pray, where, exactly did I argue against repeatability? And what, pray, constitutes a repeatable experiment in Earth Sciences, Astronomy or even biology? We certainly cannot create multiple Earths and let them evolve varying just one experimental condition–not without computer simulations. In climate sciences, repeatability means looking at behavior of the system under study at various times when a given forcing, etc. is and is not present. If the variable under study repeatedly has a similar effect on the trend–and, critically, if there is a mechanism that explains that behavior–then we have a repeatable protocol. Your insistence that every scientific discipline look like a high school chem lab suggests you didn’t pursue science beyond this point. Eventually, one day soon perhaps, the USA will be seen by most nations and a majority of people on Earth as a dangerous pariah state and the #1 threat to Humanity it really is. A Trump or no Trump is irrelevant. It’s the American people, it’s the Cult of America as a whole that is the real problem here. The really dangerous aspects arises from the abuse of American power globally founded upon the radical religiosity of entrenched American delusions of grandeur, persistent cultural schizophrenia and a permanent state of denial. In simpler terms, America the nation is unhinged. The exceptions prove the rule. M. Flynn @59 wrote: What might I be wrong about? The fact that nobody has ever managed to demonstrate that a thermometer can be made hotter by using CO2? There’ve been lots of experiments to verify the CO2/greenhouse effect. HERE’s ONE you could do and HERE’s a bit different approach, both found in about 1 minute on the ‘Net. There are other ways to show the same effect. But, don’t let facts stand in the way of your ignorance. Not sure what you are on about. ‘Mythbusters’ did a simple experiment demonstrating CO2 causing temperatures to increase, involving several tanks of air with various concentrations of CO2 added, a light source and accurate thermometers. As below. Obviously there have also been laboratory tests, and as you can see in the video Mythbusters consulted the experts. I’m sure you will pick holes in the video etc, but only a total idiot believes the basics of the science have not been proven. Happer is under consideration as Drumpf’s Science Adviser. 72 Barton Paul Levenson; and stuff your unscientific and unfounded delusional sociopathic beliefs BPL. Go write another sci-fi book about the Succubus. Maybe you could be America’s next L Ron Hubbard? 69 Fred Magyar says: Thomas @ 63, With all due respect, Thomas, old chap, did my comment perchance cause you to get your knickers all in a bunch, eh? If nobody minds getting back to the NOAA-thing, I’d like to ask if I’m wrong in thinking the issue was following established procedures or not. What I’m asking was Karl et al ‘by the book’ or not. My understanding is that the NOAA had procedures &/or protocols in place specifically to avoid what is happening now. And because those procedures &/or protocols were ignored &/or circumvented (for whatever reason) whats happening now should not come as any surprise. In fact, it should have been expected. At least by seasoned veterans. The other issue is, if current/past staff don’t have to go ‘by the book’ then any future staff don’t have to either. No? I was under the imprecision that scientific integrity was more important than expediency. Keeping in mind, quite often direction changes with management changes. Meaning what’s OK now should be OK later . . . or not? Very interesting. Ok. I’ll take Gavin’s word for it that there is absolutely nothing to see in any of the examples he highlights and just move right along very much relieved that climate science is in such good hands. Just one question though. Are there any known examples where a climate scientist has ever done anything less than achieving the ethical and scientific gold standard? Just on the off chance there have been one or two such examples, what was the general response on this blog? Happer is a very old scientist who is so old and out-of-it that he is not concerned about making a fool of himself. He is not getting any younger. The way to address twits of his ilk is to show up their monumental stupidity. This has the added impact of showing up the monumental stupidity of denialists who promote old scientists like Happer with their ridiculous lack-of-grasp of today’s science, promoters like the Gentlemen Who Prefer Fantasy in the UK who have recruoted the poor old man to their sham Academic Advisory Council. It would be interesting to see the advice these dinasaurs actually do manage provide, if any. This is my take on Happer’s best effort at climate science where he waxes ridicule on the subject of “The Truth About Greenhouse Gases”. As for him ranting on about the NOAAthingburger, if it wasn’t that he would be ranting on about something else he has no understanding of, like the jolly old hockey-stick. Perhaps Will should think about Ted Maiman’s announcement of his discovery of the laser after his paper was rejected! I’m sure he remembers it since he had just started his PhD studies at Princeton at the time and Schawlow et al. did their experiments just up the road at Murray Hill. Search your own posts here, going back years. You do repeat your errors. Re William Happer: I suggest you carefully digest all of his peer-reviewed publications that advance his opposition to the conventional wisdom of climate science. Then perhaps you could summarize them in this forum, and/or provide links to longer discussions. As a good starting point, just list all of his peer-reviewed publications that advance his opposition to the conventional wisdom of climate science. Some here are qualified to read them, and they might need a handy reference. For extra credit, name the 10 most distinguished younger students and colleagues, among those who regularly publish peer-reviewed climate science, whom Happer has convinced to adopt something close to his views. As a near-octogenarian, he will be wanting to pass along his wisdom, lest there be no one left to follow up his learned researches. Happer claims there’s a CO2 famine starving our crops and we need to burn more fossil fuel. Who’d have thought “Burn, baby, burn” would become a Republican slogan, eh? #65 – misleading. The right wing lies constantly. Dupes say that is not bad because everyone lies and misleads. Probably many do. But the volume of lies by the right wing is far beyond normal. No comparison to what ordinary people do and what Wilson and Clinton did. It is a constant tactic, the core of their political personas. Refuting their lies about climate change is necessary, but given the overall success of the right wing’s lying behavior, it is not likely to do much good. Mike Flynn… you aren’t this Michael Flynn, the author of the EXCELLENT Eifelheim, are you? @86 Forrest Gardener: There are words for the comment you have made. They are: insinuation and innuendo. The comment is insinuation and innuendo, word-for-word, and in more than one way. @87 Forrest Gardener: There are words for the comment you have made. Namely: insinuation and innuendo. It is insinuation and innuendo, word-for-word, in a number of ways. 92 Ric Merritt; you come across as an aware and well informed commentator about William Happer and his students. I suggest you take your own advice and do it yourself. Happer’s remark has no science in it. Lots of other remarks which he floats have no science either. They are just the kind of “ready-made narrative” that Gavin points out in this post. One shouldn’t give Happer credit for saying something about science when he’s doing no such thing. Happer’s eyelashes flutter like butterflies when he says that. The cultism is all on Happer’s side. And so is the overreach. First, several NOAA administrators have rejected Bates’ claims already of Karl et al breaking any supposed rules or procedures. Second, the Karl et al paper was a scientific analysis, whereas Bates saw it as a new NOAA “product”, which it isn’t.